Mr Michael Middleton has been granted a Coat of Arms in order that his daughter Kate Middleton can have her own Coat of Arms as seen on the left. Apparently the immediate Middleton family worked closely with the College of Arms throughout the design process to ensure that it is truly a representation of their family. The three acorns represent the three children in the Middleton family, Catherine (Kate), Philippa and James. The gold chevron in the middle of the design represents Mrs Middleton. Kate's Coat of Arms has been presented as a lozenge dangling from a piece of blue ribbon to indicate that she is an unmarried daughter. 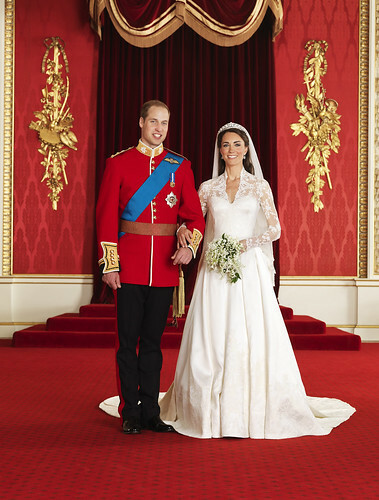 Once married a new Coat of Arms will be created made up of both Prince William's and Kate's Coat of Arms.